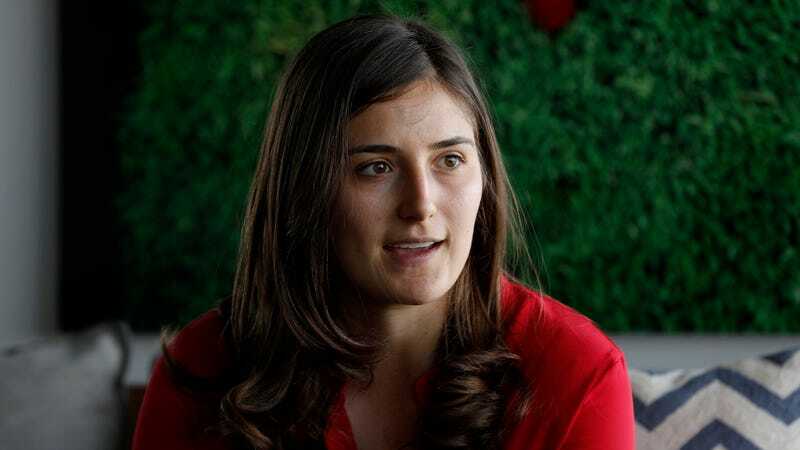 Tatiana Calderon during an interview before the Formula One Mexican Grand Prix in 2017. After former Formula One development driver Carmen Jorda undeservingly made news in handfuls of languages when she said it would be easier for a woman to drive in Formula E than F1 because the car is “less physical,” the Sauber F1 team announced Tatiana Calderon as its newest test driver. Calderon, 24, was a Sauber F1 development driver before the promotion. Now, she’ll train on simulators at Sauber’s Switzerland headquarters and in cars on site during several race weekends this year. She’ll also race for Switzerland-based team Jenzer Motorsport in the GP3 Series, a series on the F1 development ladder where Calderon finished 18th overall in the championship last year. Calderon started racing when she was 9 and drove in the U.S. and in her home country of Colombia when she was younger, according to Sauber. She got on Mazda’s IndyCar development ladder before going to race in European series like Euroformula Open, British Formula 3, FIA Formula 3 and GP3. As of last year, only six women had driven during an F1 race weekend and only two had actually started an F1 race, according to the New York Times. The most recent woman to start a race was Lella Lombardi more than four decades ago in 1976. That’s compared to more than 800 men entering grands prix during the history of F1 as of 2012, according to the BBC. Becoming a team test driver is a long way from starting a race, but people don’t often get to start at the top. Plus, it’ll be a great day when Calderon gets out on the track and shows people women can handle F1 cars just as well as men can. She certainly wouldn’t be the first to do that, but when it comes to the athletic capabilities of women, people seem to need all of the reminders they can get. That’s alright, though, because there are plenty of women who are capable of doing the reminding.